Note: An electrical diagram of Sanctuary’s DC System as described in this article is located here (Adobe Portable Document Facility (.pdf) file): 20161022_dc_electrical_distribution_system. The DC system is of the “ungrounded” system design (ABYC E11, 11.4 and E11, 11.5.4.3). DC energy for the “house” and “engine start” services originates in a single battery bank comprised of six, 6 volt, flooded deep cycle “Golf Cart” batteries. Over-current protection (OCP) for the battery bank is provided by BlueSea Systems®, Type MRBF™, 200A fuses. (ABYC E11, 11.10.1.1.1 and 11.10.1.2 and subs). Details of that design decision are discussed in my article, “Battery Bank: Separate vs Combined,” on this site. A single Group 27 start-service battery is used to start the ship’s generator. A BlueSea Systems® model ML-RBS™ remotely operated disconnect switch, with p/n 2145 remote switch, is fit in the generator’s battery feed circuit. The ship’s Main DC Disconnect Switch (ABYC E11, 11.6.1.2 and subs) for the DC feed to the NewMar® Load Center and other attached DC loads is located in the engine room, stbd bulkhead, above the ship’s battery bank. The ship is fit with six, Duracelltm, EGC-2, Golf Cart batteries. These batteries have a 20-hour Ampere Hour (aHr) rating of 230 aHr and a Reserve Capacity rating of 448 minutes. These batteries are manufactured by East Penn Manufacturing® and are sourced from Sam’s Club. The batteries are combined in a series/parallel configuration to provide 12VDC. The overall total rated ampere hour capacity of the ship’s battery bank is 690 aHr. A Magnum® ME-RCtm Remote Control, and a Magnum® ME-BMKtm Battery Monitor Kit, are installed to monitor the ship’s DC electrical operating parameters and the state-of-charge status of the ship’s battery bank. “Standard operating practice” aboard ship is to adhere to the “mid-capacity rule,” which states that lead-acid batteries (flooded wet cells, AGM or Gel) should not be discharged beyond 50% of their rated capacity and that discharging a lead-acid battery in excess of 50% of its capacity shortens its service life. Aboard ship, the ME-RCtm/ME-BMKtm Battery Monitor displays the “State-of-Charge” of the battery bank. Less overall depth-of-discharge is better. The approximate eight-hour overnight (summer hours-of-daylight) DC system electrical consumption (refrigeration, anchor lighting, evening TV watching, computer use, etc.) aboard ship is 125 – 150 aHr. The approximate eleven-hour overnight (winter hours-of-daylight) DC electrical consumption is 150 – 200 aHr. When the ship is receiving AC power from either 1) shore power or 2) from the ship’s onboard generator, the ship’s battery bank is charged by the Magnum® MS2012tm 2kW Inverter/Charger 1. The ship’s engine alternator charging system consists of a single, 12-volt, 110 amp, Balmar® high-output alternator, model 712110, with a Balmar® MC-614tm external regulator. The external regulator receives its DC input power supply from the propulsion engine’s starter solenoid 2. Attachment 1 is BlueSea Systems®, Type MRBFtm Fuse Block, p/n 2151, fit to the designated positive output terminal. (ABYC E-11, 11.12.1.2). This fuse block is fit with two, 200A, Type MRBF fuses. Fuse 1 feeds the ship’s Main DC Power Disconnect Switch 4, a Blue Sea® Systems, p/n 6006, rotary switch, via a 2-0 AWG red wire. A 2-0 red wire continues from the disconnect switch to a BlueSea® Systems, 150A, Type ANL fuse block. The house DC feed is a 2-0 AWG red wire from the ANL fuse block to a 600 amp, 4-post terminal block. The terminal block is the ship’s Main DC Power Distribution Buss. Fuse 2 connects the ship’s Balmar 110A alternator to the battery bank, via a #6 AWG red wire. Attachment 2 is a 2-0 AWG red wire that feeds the ship’s propulsion engine starter solenoid through a BlueSea System®, p/n 6006, disconnect switch located in the salon, stbd, beneath the fold-down table. This circuit is not overload protected (ref: ABYC E-11, 11.12.1.2). The propulsion engine starter solenoid is the DC system attachment point of the engine’s DC sensors, controls, instrumentation and malfunction alarms, and the external Balmar® MC-614tm voltage regulator which energizes the on-engine Balmar® alternator unit. Attachment 3 is a 2-0 AWG red wire (ABYC, E-11, 11.12.1.1.1) that feeds the ship’s inverter/charger through a Class “T” fuse block fit with a 300 Amp, Class “T” fuse. A 2-0 AWG red wire continues from the Class “T” fuse block to a BlueSea Systems® p/n 6003e disconnect switch. From the disconnect switch, a 2-0 AWG red wire feeds the Inverter/Charger. House loads aboard ship are fed from the Main DC Power Distribution Buss. A 1-0 AWG red wire runs from the terminal block to a terminal block in the electrical closet. This is the DC attachment point for the ship’s bilge pump, high bilge alarm, NewMar® DC Load Center, BlueSea Systems® WeatherDecktm Load Center, Xantrex® Inverter and shower sump pump. A 1-0 AWG red wire from the terminal block feeds the vessel’s 70 amp windlass circuit breaker. From the circuit breaker, a 1-0 AWG red wire joins in the electrical locker with an OEM 38mm2 red wire to feed the vessel’s windlass contactor, located forward, in the chain locker overhead. A #8 AWG red wire feeds a 40 amp circuit breaker which feeds the Garmin® GHP10tm autopilot system. A fused attachment feeds the Magnum® ME-BMKtm battery monitor module. WARNING: This disconnect switch removes power from the bilge pump, sump pump and high-bilge alarm circuits. Therefore, it is to be used only for attended servicing of the electrical system. It is not intended for long-term disconnection of the battery bank while the boat is in the water! An alternator is a “self-limiting” device (ABYC E11, 11.4.26). That is, “a device whose maximum output is restricted to a specified value by its magnetic or electrical characteristics.” What that means is that an alternator can only produce just so much output current – in this case, 110A – regardless of how much drive is applied to its field winding. If the alternator fails, output generally stops. For self-limiting devices, a fuse is not “required” by ABYC E11, 11.10.1.1.2, but it is a reasonable precaution. Aboard Sanctuary, the alternator connection to the ship’s DC system is protected by a 200A, Type MRBF, fuse. Two Hundred amps may seem too large a rating. The maximum rated output of the alternator is 110A. The ampacity of the #6 AWG conductor, derated because it’s in an engine space, operating in a 12V system with a 3% voltage drop and 105ºC insulation is 80A, and substantially higher for the 10% voltage drop case. So it may appear there is no scenario where the 200A fuse would protect the alternator connection wiring. It’s very important to understand that we DO NOT want that fuse to open in the absence of a true, sustained over-current situation. If the fuse were to open while the alternator was operating in its designed power output range, the effect would be to instantly disconnect the electrical load (the battery bank) from the alternator. The magnetic field inside the machine would instantly collapse, creating a very high voltage “spike” inside the windings of the machine. That spike would almost certainly destroy the alternator’s internal diodes and render the device inoperable. Alternators contain solid state full-wave rectifier diode pacs. Internal diodes prevent DC power from flowing backwards through the alternator when the engine is not in operation. If diodes fail in a welded-closed state – “shorted,” or “short circuited” – the result would create a direct path from the battery to ground via the alternator’s stator windings. The purpose of this fuse is to protect against that true over-current condition. In the case of a shorted diode, the 200A fuse protects the charging wire from becoming overloaded and, thus, a fire risk. The positive and negative DC wires for the ship’s PSW Inverter/Charger are 2-0 AWG BC5W2 boat cable. Round-trip distance from battery-to-device and return is approximately 10′. The rated ampacity for 2-0 AWG primary wire inside an engine space is 280 Amps DC (ref: http://marinco.com/page/conductor-sizes). Magnum’s MS2012tm specs state that maximum battery charging current is 100 Amps DC, and maximum full load inverter draw at rated AC output load is 225 Amps DC. Optional configuration options are available via the ME-RCtm Remote Control to limit Inverter/Charger operating currents. There are two terminal blocks in the ship’s engine room that comprise the ship’s DC return circuit to the main battery bank. The DC branch circuits and AC Safety Ground are all collected on a terminal block located fwd in the engine compartment, at deck level, starboard. This terminal block is connected to the main DC negative buss terminal block via a 1-0 AWG black wire. attachment to the battery monitor’s 50mV, 500A measurement shunt, via a 2-0 AWG black wire. The return connection to the negative terminal of the main battery bank is made from the battery monitor’s 50mV, 500A shunt, via a 2-0 AWG black wire. This entry was posted in DC Electrical System, Electrical System Topology on 2016/11/14 by gilwellbear. transmission oil pressure and temperature sensors/gauges, if installed. The propulsion engine on Sanctuary is a Cummins 4BT-3.9 mechanically injected engine with a normally closed fuel solenoid that requires full-time DC power to keep it open. The OEM sensor/gauge package is manufactured by VDO and includes tachometer, dual station oil pressure and temperature gauges and audible alarm sounders. We installed dual station aftermarket high exhaust gas temperature sensors and alarms. For those owners who perform DIY engine maintenance and repairs, I have included the wiring diagram I prepared for Sanctuary. For simplicity, this diagram DOES NOT show gauge illumination wiring. Click the following link to get a downloadable Adobe .pdf copy of Sanctuary’s engine wiring diagram: 20161022_engine_room_instrumentation_terminal_block. This engine has two different kinds of oil pressure and temperature sensors. The set that feeds the oil pressure and temperature gauges is analog. The set that feeds the safety alarms is bi-modal (“on”/”off”). Although this drawing is specific to the Cummins 4B, I would think it is “typical” of what would be found on many engines. 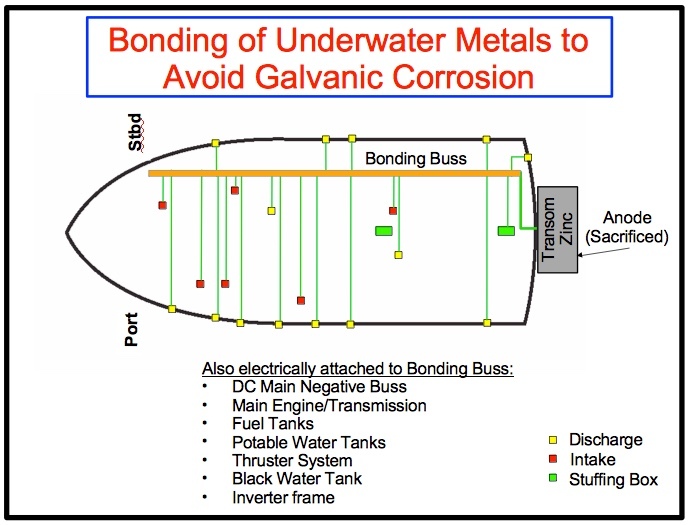 I encourage all boat owners or develop a wiring diagram of their propulsion engine. If you ever need it, having it will save the skilled labor cost involved in figuring it out, diagnosing failures and making repairs. This entry was posted in Electrical System Topology, Engine Wiring Diagram on 2016/11/13 by gilwellbear.